Girls! Girls! Girls! certainly takes the Elvis movie to new and exciting levels. Hah! Just kidding. This film just as formulaic as many of the Elvis films I have already discussed. What makes Girls! Girls! Girls! stand out is that it presents the most common aspect of every Elvis movie – that is everything leads to traditional, heterosexual marriage – in somewhat thought-provoking ways. 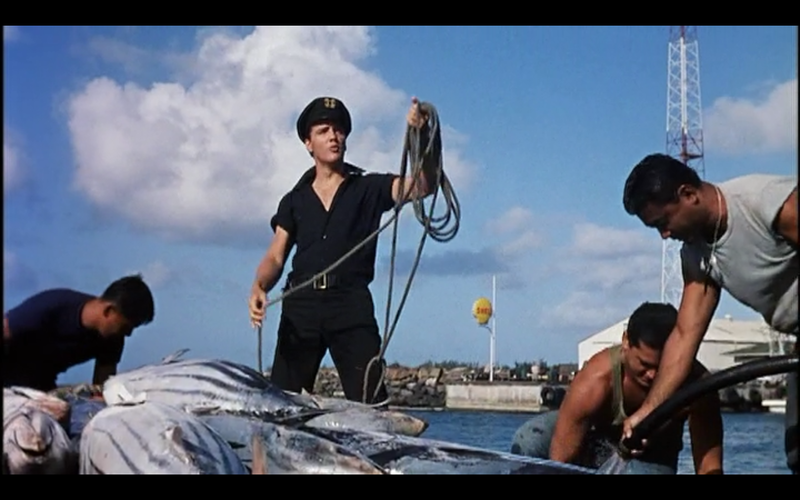 Presley portrays Ross Carpenter, a working class fishing guide and womanizer. Ross’s career as the sexiest boat captain you have ever seen (unless you love the Skipper from Gilligan’s Island) becomes affected when his boss announces his retirement. Ross must come up with a way to purchase the boat he built with his late father. In typical Elvis movie fashion, this leads to a love triangle, a brawl, and multiple musicals numbers. Ross could also be a male stripper. Just saying. 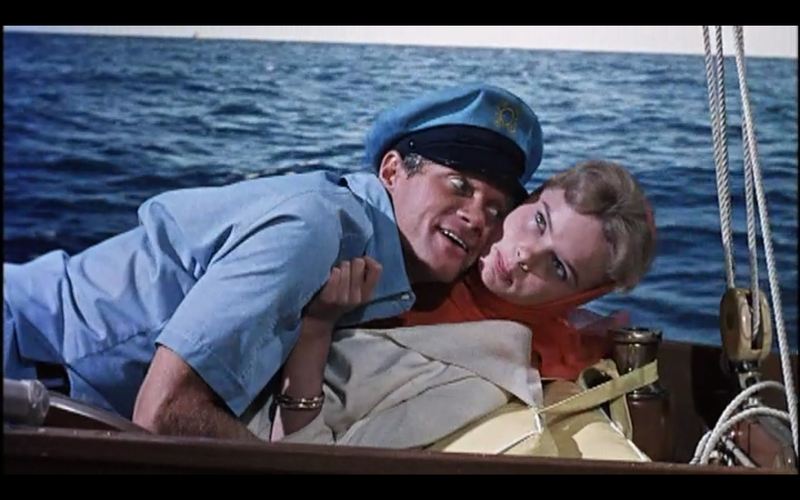 From the film’s outset, Ross is presented as a “red blooded boy” who can’t stop thinking about girls. Literally. This is the refrain of the film’s title song “Girls! Girls! Girls!” and during this opening number, women are overwhelmingly presented as objects. These two minutes are key to showing how Ross develops throughout the film. He transforms from a serial womanizer to a monogamous boyfriend. The central love triangle in Girls! Girls! Girls! starts when Ross meets Laurel Dodge (played by Laurel Goodwin) at the local nightclub where he occasionally performs. (Because of course a typical Elvis character is also a ridiculously talented night club singer.) Laurel is a very spoiled and somewhat naive girl; she is the polar opposite of Ross’s ex-fling, Robin. 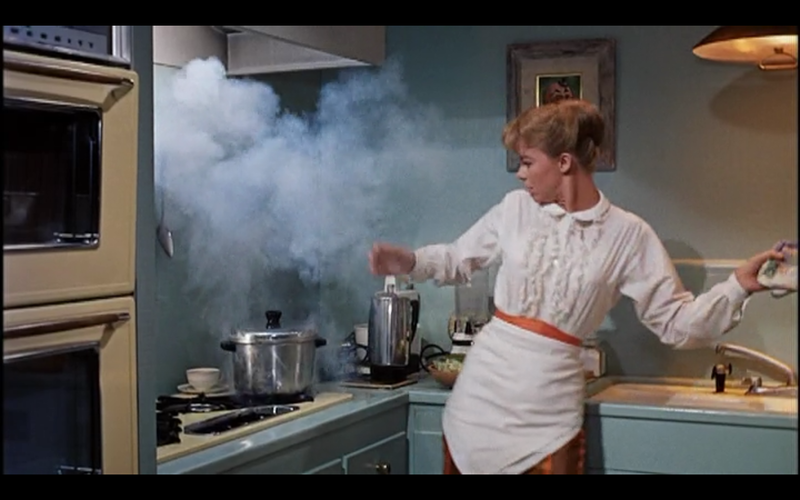 Laurel is also the worst cook since Katharine Hepburn in Woman of the Year. Ross’s relationship with Laurel begins with him aggressively pursuing her. (And the pick-up lines he uses are great: “Wouldn’t you like to go to another local landmark?” “Only the one you’re staying at.”) But eventually the two develop a serious romance. So Ross the red-blooded boy who can’t stop thinking about girls and doesn’t wanna be tied begins to change. Key to his transformation are the film’s secondary characters. Two older immigrant couples who represent successful traditional marriages. Both couples – Papa and Mama Stavros and the Yungs – act as Ross’s surrogate family and offer amusing representations of marriage. What is most interesting are the scenes with the Yungs. At first, these scenes seems like a humorous distraction from the film’s main plot. (Little Asian girls sing a cute song with Elvis! Laurel can’t use chop sticks!) But the Yungs are remarkably different from the secondary Asian characters we saw depicted in Blue Hawaii. Unlike Blue Hawaii where the Asian characters are either servants or outright caricatures, the Yungs are fully-realized characters. They don’t exist purely to introduce white film audiences to Hawaiian culture. Instead the Yungs live a rich life and like Papa and Mama Stavros, the Yungs epitomize a happy, long-lasting heterosexual marriage. It’s not a perfect representation because this is still 1962 and I find the “Earth Boy” number just a bit unsettling. Now Laurel, being the genius that she is, decides that she will buy the boat back for Ross. Without telling him. This requires her to not only ask her father for money but to also flirt with Johnson. Because that’s how naive, spoiled rich girls operate. What follows is a ridiculous scene where Ross and his fishing crew chase down Johnson and Laurel just as things are about to get… I don’t even know what to call this. Eventually Ross figures out that Laurel bought the boat for him. He swallows his pride and accepts her generosity. Or something like that. Because of how formulaic these Elvis movies are, the final minutes always drag on and on. If there are any resonating plot developments, I forget them. I do know that Girls! Girls! Girls! ends with Ross and Laurel agreeing to get married. And possibly live together in sin. What also frequently happens during an Elvis movie is that during certain musical numbers the Elvis character completely transforms into Elvis Presley, the singer. The film’s characters and plots are absolutely forgotten. We see this in Girls! Girls! Girls! when the film concludes with an absurd reprise of “Girls! Girls! Girls!”. Laurel completely disappears from the scene and anything about Ross’s transformation from a womanizer is forgotten. Suddenly Elvis Presley is leading an over-the-top dance party that raises more than a few eyebrows because of how easily it embraces cultural stereotypes. Oh silly me. Yet again, I’m reading far too much into an Elvis movie. 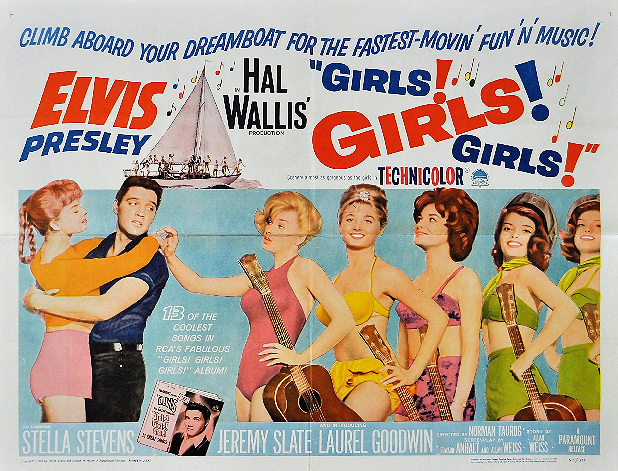 Just watch and enjoy the conclusion to another amusing and bizarre installment in Elvis Presley’s filmography. One Last Note: Don’t search “Girls! Girls! Girls” on Tumblr. Trust me. It is for your own good. Author JoannaPosted on July 31, 2013 August 4, 2013 Categories 1960s, The Elvis FilesTags Elvis Presley, Girls! Girls! Girls! Does anybody know who the cute little Asian girls are that sang with Elvis in Girl’s,Girl’s,Girl’s! ? What happened to the actresses that played them?